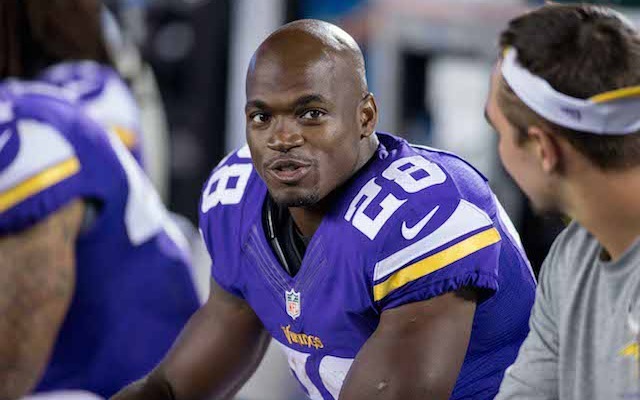 The NFL announced today that it has rejected Viking Adrian Peterson’s request for immediate reinstatement following Tuesday’s plea agreement reached over his child abuse charges and has refused to discuss any settlement over Peterson’s playing status, according to Fox Sports’ Mike Garofolo. Original felony charges of reckless or negligent injury to a child following Peterson’s hitting his four-year old son with a switch were reduced to a misdemeanor charge of reckless assault, to which Peterson pleaded no contest. He’s now been ordered to pay a $4,000 fine and perform 80 hours of community service; he will face no jail time. But Peterson has been informed by the league that his case will be reviewed for potential discipline under their personal conduct policy and asked him to submit any relevant information. They also asked him to meet with “designated experts who will make recommendations for the commissioner’s consideration.” He will remain on the NFL’s exempt/commissioner’s permission list until his case is resolved. A report from ESPN’s Adam Schefter indicates that it’s “highly unlikely” anything will be resolved until next week at the earliest.